Many people think that IT infrastructure is critical, but not something that provides unique differentiation and competitive value. But that’s about to change, as IT starts implementing more “data-aware” storage in the data center. When business staffers are asked what IT should and could do for them, they can list out confused, contrary and naïve desires that have little to do with infrastructure (assuming minimum service levels are met). As IT shops grow to become service providers to their businesses, they pay more attention to what is actually valuable to the systems they serve. The best IT shops are finding that a closer look at what infrastructure can do “autonomically” yields opportunities to add great value. 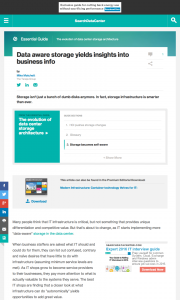 Today, IT storage infrastructure is smarter about the data it holds. Big data processing capabilities provide the motivation to investigate formerly disregarded data sets. Technological resources are getting denser and more powerful — converged is the new buzzword across infrastructure layers — and core storage is not only getting much faster with flash and in-memory approaches, but can take advantage of a glut of CPU power to locally perform additional tasks. This entry was posted in Published Articles and tagged Modern Infrastructure magazine, SearchDataCenter, Taneja Group by Mike. Bookmark the permalink.